Corrupt tax collector. A male Gotal. Bounty hunter. 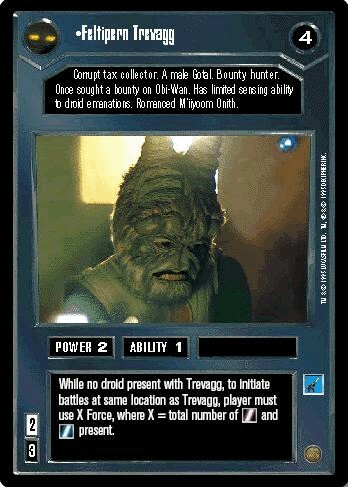 Once sought a bounty on Obi-Wan. Has limited sensing ability to droid emanations. Romanced M'iiyoom Onith. While no droid present with Trevagg, to initiate battles at same location as Trevagg, player must use X Force, where X = total number of [Dark Side Force icon] and [Light Side Force icon] present. Also see here for all trade lists with any card fom "Premiere".